To get even more tips on buying your first home, follow #BuyerInsights on Facebook, Twitter, Instagram and YouTube. As the nation adjusts to life after the downturn, some luxuries are becoming realities again. In the housing market, vacation homes saw a massive surge in sales, rising 57 percent in 2014 over the year before. This stat, from the National Association of REALTORS® (NAR), came from a bigger survey of vacation and investment home buyers. NAR’s survey also showed that vacation homes accounted for 21 percent of total home sale transactions in 2014, which is the largest share recorded since it was first conducted in 2003. But what does that mean for our local market? For starters, our “vacation home” market is largely relegated to lakeshore homes across Minnesota and western Wisconsin, so we’re predicting that the waterfront home market will continue to see an upswing. For local buyers, this could mean an increase in competition, as their neighbors enter the vacation home market, too. Below, we remind buyers what they can expect as they enter the lakeshore home buying market. Waterfront homes are traditionally more expensive than non-waterfront homes, but today’s pent up demand may widen the gap. Buyers who are searching Brainerd lake homes, for example, will find that the median sale price is $280,000 for a property with a private waterfront. If that’s higher than your budget, you could consider a home with lake access, which means that you can still launch your boat from a public access, but you won’t have a private waterfront lot. In Brainerd, buying a lake access home lowers the median price to $167,500, which may be more in line with what you can spend (Minneapolis Area Association of Realtors®, MAAR). The good news about these prices? They are still far below what we saw prior to the economic downturn and will continue to appreciate with continued market improvement. With the rise in demand for lake homes, we anticipate that buyers may scoop up high-quality listings that come on the market within the next few months, so they can enjoy a full summer “Up North” or due west, in Wisconsin. 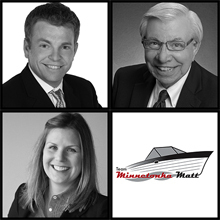 If you’re looking to buy a lake house or cabin in Minnesota or western Wisconsin—and be all moved in by the fourth of July—we advise you to work with one of our local lakeshore experts to determine your desired location, budget and home type upfront. Then, whether you’re in the market for an Alexandria lakeshore home or a Spooner, Wis. lake cabin, you’ll be ready to move when the right property is listed. Reach out today to start your waterfront home search. There’s a big difference between the price of a modest lake home and a waterfront luxury home with accommodations for your entire extended family. Test out some online searches to see what kind of property looks right for you, and is in your budget. We can work together to determine where the big rise in prices occurs for your local market. For example, private three-bedroom lakefront homes in Crow Wing County have a median home price of $290,000. But when you increase to four bedrooms or more, the median price jumps to $420,000 (MAAR). That makes sense when you think of some of the really large estates you see along the Whitefish chain of lakes. But our market offers an array of choices, from properties on lakes large, small and in between, and in different price points. It’s all about knowing your needs and doing your research until you find the right home in the right place. It may be a busy season for lakefront home buyers, but we are here to help! Edina Realty has the best lakeshore home search in the market, and we can help you search in every market across Minnesota and western Wisconsin. Begin your lake home search here, or reach out today to start your search in person. Plus, keep an eye on Twitter and Facebook, where we’re sharing exclusive #BuyerInsights. Get the facts. Be informed. of properties have had a price adjustment. properties that remain on the market. Based on information from the Minneapolis Area Association of REALTORS, Inc. Data collected from the REGIONAL MULTIPLE LISTING SERVICE OF MINNESOTA, INC., for properties in the 13-county region exclusively.